Christmas is a wonderful year with wonderful memories of joy for our family. Thank you Laura for this wonderful year of tangling. challenges....see you in 2014! 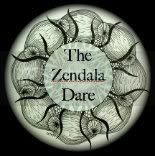 Today my blog reached the all time high of 100,142 Visits....Thanks to you all for making my zentangle efforts so much fun to share! Laura shared with us her own tangle pattern Boo*Kee and I could just see the little snowmen. I love when Christmas tangle ideas just pop into my head. We had a great week......another daughter happily wed and wonderful family memories. Now to get ready for Christmas! Happy tangling!